Install Free Neon MiniStix Tubes for a Complementary Glow! The Free Neon Ministix tubes fit Anywhere your imagination so desires! The tubes are fitted with stylish Chrome Endcaps, have a very Bright neon glow, includes self adhesive tape for easy installation, and are Shock resistant and Lexan tube protected for added durability. Now with Neon MiniStix tubes, you can hide your neon in all those hard to reach places! Perfect for mounting under seats, under the dashboard, speakers, or anywhere else you can possibly imagine! All necessary instructions and hardware are included to ensure a smooth installation. 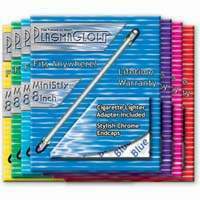 Neon MiniStix tubes are complete with a transformer and have a simple 2-wire hookup. MiniStix are waterproof and sealed in a high-impact tube for guaranteed durability, and are backed up with the PlasmaGlow Life time Warranty! $29.99 for a 8" Ministix.